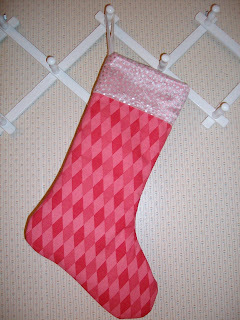 I was able to get three more Christmas stockings made this past weekend. If you want to make one of these, see my Christmas Stocking Tutorial on the left sidebar under "Tutorials". Adorable! 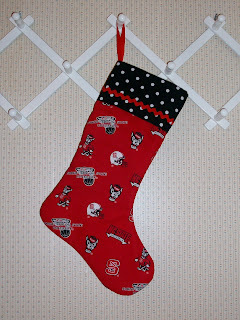 Love them both... the state stocking is really cool! Nice stockings, and thanks for the tutorial. Every year when I hang up the old felt stockings I tell myself that next year I'm going to make new ones. It hasn't happened yet, though. Sigh. Those are super cute! Of course, I am not surprised when you sew anything, it's always lovely. How are you enjoying Elizabeth George's book, I just bought her latest but haven't had time to get beyond the first chapter. Now I have forgotten what I have read, and have got to start over.lol Maybe the first of the year, as I have company coming this week. She is such an inspiration to me, I am so glad I found her books. I want to wish you and your family the most blessed and Merriest Christmas. They look wonderful, Debbie. I like the pink diamonds. Hey Debbie, those are great. I love the pink diamonds. I made one for Johnny the other day, I should have used your tutorial, it would have saved me some time. hope you're enjoying your Christmas season! I have just found your lovely blog. I also lave to quilt and patchwork and so many other crafts I don't get time for.